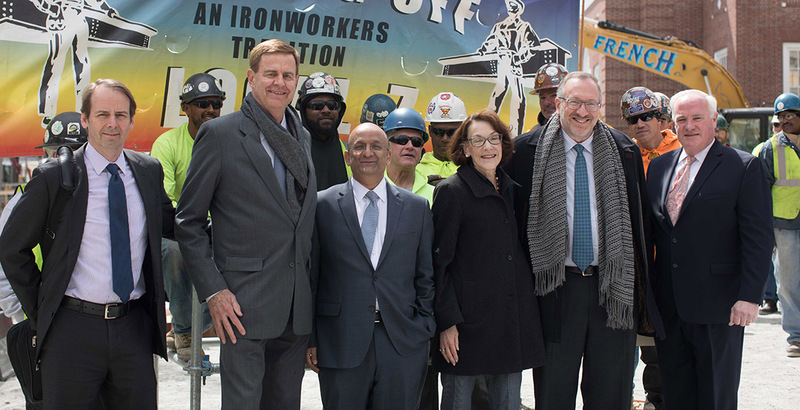 (LtoR): Cliff Gayley and Architect William Rawn of William Rawn Associates; Dean Nitin Nohria; Beth Klarman; Seth Klarman; Richard Walsh, President & CEO of Walsh Brothers construction management. BOSTON—Harvard Business School held a topping off ceremony today for Klarman Hall, a new convening center expected to open in 2018 at the southeastern end of campus. The ceremony traditionally marks the halfway point of a building’s construction and is commemorated by signing and raising the highest beam in the building’s framework. Klarman Hall will combine elements of a large-scale conference center, a performance space, and an intimate community forum. The building was made possible by a generous donation from Seth (MBA 1982) and Beth Klarman, both of whom were in attendance at Wednesday’s ceremony. Seth Klarman is president and CEO of The Baupost Group, a Boston-based investment management firm. Beth Klarman is president of the Klarman Family Foundation. Both are members of the School’s Board of Dean’s Advisors. “We hope that Klarman Hall will be a world-class addition to a world class institution,” Seth Klarman said. He added that he and Beth Klarman look forward to the center serving as a hub for convening diverse groups for productive discussion on everything from the economy of the future to the potential of free enterprise to business ethics and corporate values. Harvard Business School hosts some 700 events a year in which tens of thousands of people from around the world participate. Upon its completion in 2018, Klarman Hall will be able to accommodate and optimize events of up to 1,000 guests, will feature state-of-the-art technology, and will have a LEED Gold or higher sustainability certification. It is being designed by the Boston-based firm of William Rawn and Associates and overseen by Walsh Brothers construction management.